Yes! The first weeks are so encouraging (if not also exhausting) as you see instant proof to the dietary and lifestyle changes that you are establishing. Wonderful, keep going. 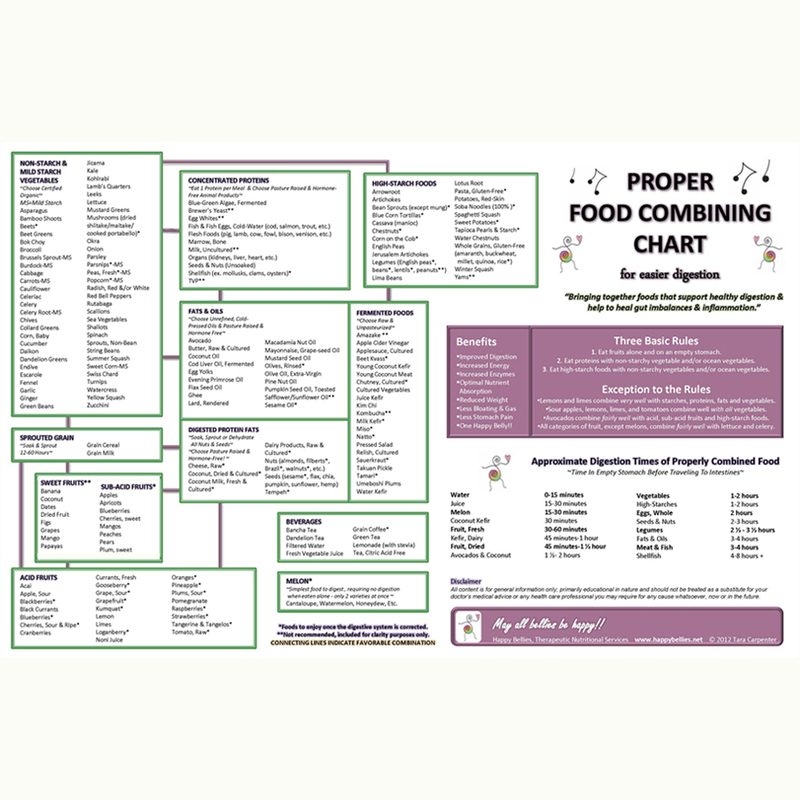 Make sure to check out my Food Combining Chart and Beginner’s Recipe for Making Unsalted Cultured Vegetables …. I created both when I was on stage 1 and wanted to make things as easy to understand and fool-proof as possible 🙂 I also started a couple groups on FaceBook. One for parents of kids on the diet and another for recipes and such. Thanks soooo much for the information on your site. My husband ordered the BE diet book online the other day and I can hardly wait to have it in my hands. I must admit I’m a bit anxious about the process of fermented veggies and sprouted nuts, etc. Your site has been a much needed resource for me as I anticipate “our” (as my husband and I will be following the diet as well) future food choices/combinations. It’s a daunting task, but we’re really optimistic that our son’s health will greatly improve with every day that passes. I’ll keep you updated. I am currently using the coconut kefir starter with the EcoBloom. Is it ok if the temperature goes up that high? Or it has to be super consistent? Thank you for your time hope to hear from you. Glad you got the oven kit all set up and running! Excellent. A bit of cloudiness is normal. Is it fizzy and carbonated when you open it? One more question …. did you use kefir starter or the contents of a probiotic powder capsule to start your coconut kefir? Hi Tara how do I know if I have a spoiled coconut kefir? Mine looks cloudy at the bottom almost as it didn’t dissolve I kept my temperature 70-75 degrees for 36 hours. Hope to here from you thank you. Hello. Thx for sharing your ideas & recipes. Where’s the rollout cookie recipe? The link to it led to this page. Hi Tara my name is Delia I just bout Donetsk incubater kit and I am having a hard time calaberating the device I was wondering if there is a customer service line where I can get walk me threw the instructions l thank you. Depends on how they were made. I use a traditional chinese medicine method which naturally preserves them for many years; well into menopause and other hormonal fluctuations. I also recommend that parents keep their capsules in the freezer and I insert a dry satchel inside each jar to help prevent them from getting moisture in there. how much water should you use to dissolve the gelatin? I am still not clear on this one. I believe wild rice is a grass, so it may be okay depending on your health issues. It’s high in protein and lower in carbohydrates compared to other rices, which is ideal for those healing yeast overgrowth (or gut dysbiosis), but still contains enough starch that most avoid for first few weeks on stage 1 of Body Ecology Diet. If you decide to try it, look for certified organic Canadian wild rice (which is grown in natural bodies of water) from traditional varieties. may i ask your thoughts on wild rice please? is that ok for stage? Thank you as it is listed under non starchy vegetables in the list above. Red-skinned potatoes, and all potatoes, are considered a high starch food and best combine with vegetables of all kinds, fats/oils, and fermented foods. It does make a lot! I have hungry boys and men to feed and so they disappear like hot-cakes. If you have a smaller family or eat on the lighter side, know that the batter stores well for a quick ‘n easy breakfast/snack in days to come. The waffles themselves also freeze well; especially great for times of travel. I make a bunch and store in a Ziploc freezer bag with parchment in between. Then on day of eating, I steam them on stovetop. YummY! I was wondering if i could please have clarification in regards to Red Skin Potatoes. This makes a lot! For more like a family of 8. Also be weary if you are not fortunate to have a large high speed blender than only half of this mixture will fit in a regular blender. Tastes wonderful though! Good question, this is not something I have calculated but if you do please let us know! My placenta encapsulation service is based in Vermont and New Hampshire. I would search for an Encapsulator in your area. Good luck! Do you know how many teaspoons in a half a pack of BED kefir starter? I would like to order the laminate food chart. I can’t complete the order due to no shipping is being added. Do you still have this or do I need to order I online? Is coconut manna/butter allowed on stage 1? £ was go to make fat bombs for my kids. How would you culture coconut flour? I believe that they all are Heather. Is there one in particular you are not sure about? I want to know how everyone says MSG is bad and you mention that children under 12 can’t process it too well, yet it has been used in Asia for hundreds of years and the kids in Asia seem to grow up fine. Do you know if coconut aminos liquid aminos of any kind are allowed on phase 1? Thanks! Theses sound great, except I can’t have coconut… Do you have any muffin recipes without coconut? Do you let the meat drippings cool so you can remove the fat first? This past week I started drinking a 6-8 oz glass of water with Bragg’s Aminos in it. Good idea or bad? So my girlfriend made a soup for the second time the other night. The first time I had this soup, I loved it! The second time she made it, I broke out in hives, REALLY REALLY BAD hives, all over my body. I do get hives when I eat something I’m allergic to, and have hives since I was a kid (mainly from artificial cherry (capri suns). The second time she made the soup, the only difference was we used Liquid Aminos we bought the other day from Mom’s Organic market (grocery store). I ate it again the second night (this was before I knew it was the soup), and I broke out in hives again. I googled Liquid Aminos and found this site and others, and also found an article that states people who get chronic hives, can experience hives when they are exposed to MSG. I’m a 31 year old Vietnamese American who grew up eating a lot of food which probably had some MSG in there, but NEVER broke out in hives like this before. Now I’m wondering if there is something else in the Liquid Aminos that could be causing me to break out in hives. Why is the above list more extensive than what’s in my copy of Donna’s book? I have the 10th edition of, “The Body Ecology Diet”. Has this list changed over the years? Should I stick with what’s in the book? Please let me know. Thank you in advance for your reply. Thanks Tara for all of your great information and support! I have been on the diet a little over a month and I feel like a new person. I have had pain for 10 years through out my body. Since starting the diet the pain is goneI! I can’t wait to see your food combining chart. That is where I have been having a hard time. Have a wonderful day! You just want to add in a bit of cold water to your churned ball of fat and knead it with your hands – this massages out remaining buttermilk and helps to make your butter last longer and have a more rich flavor. How do you wash butter? i’ve never used a blender as Bauman always taught me to make by hand. Do love the idea of making the whole process easier though! Hello! Thanks so much for the recipe! Did you leave out 1/4 cup Lakanto in this recipe, as is included in your Almond Roll-Out recipe? Thanks in advance for the feedback! @erit83 I’m glad the Braggs liquid aminos don’t affect you negatively at all. I’ll have to find out what blood type I am; thanks for bringing that aspect (often overlooked) into the conversation. Yes, live kefir grains are a different method than the one used here. I don’t have experience with them myself. I am most comfortable with the starter packets and I find that one packet gets me several quarts of transfers and so I am happy with this 🙂 I will say that what you use really depends on what you have going on as far as health conditions. I was introduced to this way of preparing kefir when I was diagnosed with systemic yeast overgrowth and started on The Body Ecology Diet to correct this issue. The idea is that the starter packets are sterile and contain specific strains of probiotics that are known to target the harmful yeast (and bacteria) pathogens living in the digestive tract and move them out of the body through elimination. These microflora have been specially chosen to be in the starter packets because they heal the intestinal lining, which is especially important to those with a permeable gut or a permeable blood brain barrier like with autism, Chrones, ADHD, irritable bowel syndrome, Celiac, etc. Can you use live milk kefir grains to make this kefir? I have done this with milk for a long time. When I continue the batches I only have to transfer the live grains to the next container of milk. Thank you Abi. We mamas do all we can do when our kids are not feeling well and sometimes that includes moving mountains, or at least that’s what it feels like! Your courage is an inspiration, Tara. What dignitiy you offered to that little girl in holding her through the entire arc of her precious life… sending love! amazing. my partner, my mother, and I are at the beginning of our journey with the body ecology diet, and snacks have been one of the toughest things to figure out! you are such an inspiration… we have already made a bunch of your recipes, thank you so much!! I would caution anyone displaying symptoms of allergic reaction to soy products to exercise common sense toward the ingestion of any condiment or food additive containing soy–including Braggs. Otherwise, there are so many positive qualities associated with the amino acid profile used in Braggs “Liquid Aminos” to disregard using it, altogether. If it causes bad side-effects, then don’t use it. Sometimes people dive into untested waters only to discover the temperature shock all-too-late. Try easing into any new product slowly, and cautiously. Even, otherwise, healthy probiotics can cause adverse side-effects when not approached cautiously using good common sense and gradual introduction–allowing the body time to adapt to it and create a harmonious balance. It is the “cold water ‘shock’ effect”; toxins built-up over long periods of time will manifest itself in the form of hives (rashes), or even mild flu-like symptoms when they are being “swept” from the body. Please don’t discredit a time-tested product based on hypothetical conjecture, or negative reactions due to personal sensitivity reactions. Hi Sandra, yes you are much to far! Though I grew up in Silver Spring, MD and would love to come back to visit and encapsulate for you! Go ahead and look up another PBi-Placenta Encapsulation Specialist in your area by going to Placentabenefits.com This is who I trained with and I have some lovely colleagues all over the country. If you still have a hard time finding someone, try connecting with local midwives and doulas and inquire if they know anyone in the area. I recently tried Bragg’s Liquid Aminos as I haved developed an intolerance to gluten products. I have tried the grocery non gluten soy sauces and was terribly dissappointed. I found I prefer the liquid aminos in my asian food I love so much! I have had adverse affects of MSG before, but had none with this product. I am so happy to have found a substitute for soy sauce that I love!!! I was prescribed with Zofran but didn’t work for me then tried an organic tea as told by a friend called No to morning sickness tea that worked wonder and my nausea vanished as it didn’t appear. Morning sickness was so bad in my both pregnancies that it was killing me. I was puking and all the time was nauseating. No to morning sickness tea was the only remedy which worked with my second pregnancy and eased my sickness immediately. I was in a hell with my both pregnancies due to all the time nausea and projectile vomiting that was killing me insane. I was prescribed with Zofran but wasn’t ready to take this med with lots of side effect. Thank God, No to morning sickness tea was the life saver for me that eased my symptoms all in a sudden. I am wondering what the actual AMINO ACID content is! I’m trying to track that in my diet, but can no where find that Braggs “contains” any particular amount/percentage. So my question is, is it even worth it? Too Allergic, try coconut aminos. Low salt, no soy, no fermentation. I avoid soy, and I love it. I too have tried Bragg’s Liquid Aminos. I have a significant intolerance to MSG and develope horribly painful headaches from it. I have the same reaction to Bragg’s. Is there a sight that lists the amount of MSG in different products for comparison? Thanks for clearing that up, for me, Tara. This recipe calls for 4 cups of soaked groats. How many dry groats, do I need to soak, to make 4 cups of soaked groats? I know they will expand a lot, but not sure how much. Hi. I am having trouble finding help with placenta encapsulation in Southern VT. If you have any suggestions I would really appreciate it. Thank you. Hi Olivia, I did try this and it didn’t catch. Something about the hemp milk sweetened with the brown rice syrup has the right thickness to it to get a really great kefir going! Hi Tara, I have some unsweetened hemp milk could I add sugar to it and start the fermentation? I have been using Bragg’s Aminos since 1986. I am enormously reactive to MSG. I can say, unequivocally, that I have no negative reaction to Bragg’s Aminos. This product had been available for 5 decades. I can find many reasons why some say they do. People with Blood Type B, and the Non Secretor sector of Blood Type O should avoid Soy, in any form. Then there are the manufacturing trolls and the ,’ right,’ thinkers who want to preach their truth as the only truth. I read people who identify themselves as ,’ nutritionists,’ ‘ health care providers,’ and I winch as their dialogue quickly identifies them as graduates of their own min d, or the,’ School of Crackerjack.’ As a real practitioner I fine it easy to out the trolls. The isolate resulting from reaction of hydrochloric a similar to stomach acid to soybeans is not MSG. Sodium and salt are not synonymous. Police are usually present at holdups, but they are not the robbers. For Blood Types A and AB soy is a nutritional medicine. Anyone truly having severe reaction to a serving of BRAGG’S AMINOS, is confusing reacting to something else in the meal or their gut flora with this healthy product. Paul and Patricia Bragg are among the greatest health icons. Decent people like them don’t produce public scourges. That’s big commerce’s platform. And it stoop to the lowest to condemn the real health products. I haven’t tried slow cooking it, but I don’t see why it wouldn’t work. I’d just watch it closely the first time you do it, as some slow cookers heat up quite hot and it’s best if this stock simmers at a very slow bubble. You could always lift the lid a bit to keep it so if need be. Thanks for sharing! I wonder if i can slowcook this one, have you tried? After working with placentas for a few years now, there’s a definite vitality to some. This one was above in beyond…meaning it had great iron, deep red color, dense tissue, intact membranes, no calcifications, etc. Such a great recipe and will add a fantastic depth of flavour to any dish used in. I personally can’t stand the smell and need to get over that, I have a tub of langoustine heads in my freezer all ready for stock making…. Yes, I use a variety of stocks as the base for many things that cook in liquid. I bet that risotto would take on a lovely flavor when cooked in the fish stock! A dietition is backed by law and degrees, a nutritionist isn’t. This blog = opinion, period. She even says it in the beginning. Do your own research folks! This is such a great idea! I’ve never thought about making stock from salmon heads. How cool. I bet this might taste really good in a risotto with fish? Thanks for sharing your recipe! Can I pressure can this ? Tara, what do you eat the pesto on? Can you give me specifics on placenta skin care. I hear its very good for the skin. I recommend them often to my new moms who run out of their own placenta capsules that I make from them after they have a baby. I also have 50-60 yr. old clients who I suggest them for because of their hormonal regulation effect. I personally have taken them for 4 yrs. or so now. I started them because my periods were irregular (I am 42) and they straightened them out. Also greatly helped with my irritability. I carry them in my purse and take them during the afternoon slump and swear they energize me! You are amazing, Tara! You have a true knack for this way of cooking. Thank you for sharing with us. Can you tell me if you have experienced from other women that sheep placentapills have relieved menopause symptoms? I am from Holland and I cannot find any reviews from this topic. What I learned from a 95 year old midwife back in 1970 was that sucking promotes milk production, so don’t give up! unless there’s something else going on that’s creating a low supply. Tara, this is beautiful! You’ve figured it all out. Thank you for sharing! The explanation of this so-called soy sauce substitute in the article probably is right. Trichloropropanol (MCPD) will be made during the this modern bio-reactor method. This chemical is generally considered as a contaminant in food by WHO. Hopefully, the truth will be revealed to public soon. There are some naturally brewed No-MSG, less-sodium and gluten free soy sauce available on the market. Those will be better options. You All Realize The Msg Debacle Has Been Disproven Right? And most symptoms from msg sickness are just conformation bias. Msg is just sodium and glutamine, both these things you get in a regular diet, sodium being just table salt, and glutamine being an amino acid in pretty much every form of protein you eat. Don’t be afraid of msg. And for the record msg does not spike creatine levels that’s just ridiculous. We are spoiled as we live right next door to some traditional miso makers and that’s where we get a variety of kinds. They are a family-owned and operated company here in Vermont called Rhapsody. You can find them now in many small health food stores on the east coast and I believe even in Whole Foods here. Not sure though where you are. I also recommend South River Miso which can be found more easily. We like their azuki bean miso which is a 1 year old miso but they have richer ones aged longer if you prefer. Either of these brands are great and both are unpasteurized. I had a complete hysterotomy and just want to know I’d there is any side effects raking this product. Tear jerking along with the bits of humor, Tara. I remember your first pregnancy when you would ask me to please stop cooking and the way you walked like a zombie to the bathroom. In bed all day. I’d never seen anyone so sick. You’re right. Anyone with HG needs someone to help them. It is no fun. I also remember all the happiness surrounding the birth of a healthy baby boy. I tried these & oh my goodness! I emailed Bragg’s about the MSG and this was their reply: Bragg does not add any MSG to its liquid amino products. However, MSG is found naturally occurring in many foods, such as mushrooms, tomatoes, parmesan cheese, and soybeans. Since Bragg Liquid Aminos is made from soybeans, there can be some very small amounts of naturally occurring MSG. Patricia Bragg is personally very opposed to adding MSG as a food ingredient to foods, and she is very sensitive to MSG. Many of our customers who are very sensitive to MSG have never had any adverse reactions to Bragg Liquid Aminos. Bragg Liquid Aminos is made by a proprietary method. As a result, we cannot answer specific questions as to how it is made. We have several companies who are trying to copy our product and make Bragg Liquid Aminos “knock-offs”. Some companies have contacted us to get an idea of how we make it. In order to protect the “recipe” or formula for Bragg Liquid Aminos, we do not answer any specific questions in regards to the war it is made. Fermented cod liver oil is the traditional way to go. Basically, anytime a food is fermented, its nutrients increase 10-fold. To get geeky on you, the lacto-fermentation (method used to make FCLO) breaks down the vitamins (like A & D) into much smaller molecules that are easily absorbed in your digestive lining (mouth on through to intestines). So you get more for your buck and possibly need less of it cuz of its potency. It’s also a raw food so without the fermentation it wouldn’t be stable. Another way of looking at this is to take milk and ferment it into kefir. The casein (milk protein) and lactose (milk sugar) will be broken down/pre-digested in the fermentation process. So, someone who is sensitive to dairy may tolerate fermented dairy. Not sure, I’ve never tried it. My main aim with this recipe was to keep it flour free. Try it though and see how you go. I bought Braggs too and felt AWFUL after using it, even more so than when I use regular soy sauce! I never knew why until I read this blog. Thank you for looking in to this. I would get a headache, achy, fatigue and a bounding pulse (throbbing in my feet and hands). Hello! How do you determine if a placenta is vital or not? Why is fermented better than plain cod liver oil? If you could find a cod liver oil that wasn’t processed with solvents, etc. would it be as good as the fermented variety or is there something that fermenting it gives you that plain doesn’t? Okay, I didn’t read your recipe thoroughly, and I just went to our local health food store and bought organic BuckWheat Flour instead of groats… is this okay? I use Kaolin clay (also known as China Clay or White Clay). It’s one of the more gentle clay available. What kind of white clay is used? It’s by one of my fave bloggers. She’s evidence-based. Which comes in handy with stuff like this. I am vegetarian and so take flax seed oil, is this as healthy? Yes I know. Any bigger and it becomes to easy for others to copy. Let me see if I can make it a tad bigger though. You are not the first to mention this! Hi! Unfortunatly it is not posssible to se the food combining chart as a bigger picture than the small one on this page. I don’t think so. Though I’ve only used my round cake pan to make it. If you go with a glass pan grease it well and sprinkle with some cocoa powder. This can help the cake to not stick. And let us know! Tara, do you have to have a special pan for this? I recently came across Bragg’s liquid aminos while trying to find a healthy chicken fried rice recipe. After reading your post, i will definitely be looking further into this product before i add it into my food. Thank you for sharing this information! A neighbor recently recommended this product in place of regular soy sauce. So I decided to see what I could find online. And here we are. So glad I found this site before spending my money on this product. When I was healing systemic Candida I did not eat tamari either. I found salt and Herbamore to be my daily seasonings. Now I am able to eat tamari but still prefer plain salt! I did get fun salts like Celtic and gray/pink salts to keep things fun and variety. What does someone who can not have fermented anything or gluten do? Die. There is no soy sauce alternative for someone like me because ALL non-Bragg’s is fermented because we humans are addicted to alcohol and need it in everything! I’m over it. I will just keep using my Bragg’s as I have no alternative and want flavour. Would you send me the linked page as to where you found this? I can’t seem to find it on my website! is this something I can use in my website? You probably know that I am expecting my second child since Thomas has a new French teacher now 🙂 I hope Ben is doing well in his new school. I have been thinking about encapsulating my placenta, and so I am emailing to ask about your fee, and how the process goes. I am due on January 26! Please email me directly and we can discuss your needs. I charge 70$ for a 60 minute session and 100$ for a 90 minute session. I just started a diet that uses Bragg’s as a seasoning and I didn’t know what it was. I am so grateful for finding this site. I cannot tolerate MSG and I will definitely use an alternative or not at all. I think it’s horrible that the public is put in danger by companies that provide false advertising. Thank you to all who responded to the articles on this site. I am intersted in learning more about Mayan Abdominal Massage. I can’t find your prices and other specifics about this service on your website. Can you please email with info about sessions. Hi Jeannie. Thank you for your kindness. It felt good to write this post – through tears nonetheless. Yes, you are welcome to use the photo’s (and the posting itself) from this page. I simply ask that you include a photo credit for Happy Bellies website. If you need them emailed to you please let me know, tara@happybellies.net. First, let me express my sympathy for your loss. I am the founder of a non-profit organization and teach hospital and church staff about the importance of helping a family in grief when a miscarriage occurs. I am writing to request permission to share pictures of your precious little one in my teaching. Thank you for considering my request. It’s good to see you writing again, Tara. You always have interesting things to say in an interesting way. I agree with you. S.O.U.L. I’m so appreciative for my own local Farmers Market where we not only get high quality food, but get to know the people who grew it and support them in their efforts. This product is being tauted as a soy substitute, but it is made from soybeans. For those of us in this world that have a severe soy allergy this can be deadly since the product is not labeled correctly. JUST BE HONEST IN YOUR LABELING. The FDA should require the absolute truth on product labeling. Once you carry a child in your womb you are a mother. Even if your child is unable to continue to grow and stay with you physically. I will always feel connected to my baby girl and to other women who have lost a child in this way. Im terribly sorry for your loss. And admire you for the strength you hold even tho you went through such a loss. Your baby girl was beautiful and very lucky to have a mother who will never try to forget her forever she will be with you. And love you very much for the memory you hold of her.Thanks your story is very touching! Why do they all, including Tamari, have to have vast amounts of sodium!? You are correct that the bottle used to say “No MSG” – but no more. I was appalled to find this out, as I have reactions to MSG & have to be careful what I eat. I believed them & thought this was safe! Last year I ended up in the emergency room & had many tests. They couldn’t figure out what was wrong. When my nutritionist read my labs, she identified the source of the problem right away from my elevated creatine levels – MSG. I need to contact my nutritionist to inform her that the Braggs Liquid Aminos that they recommended to use in their nutrition handouts contains MSG! We should be able to do more with deceptive & misleading labeling! Reading this article was such a bilessng to me today. Thank you for sharing your insights in such an interesting manner. The information has been useful to me and I will continue to use it. Thank you for your comment. I have since learned that I must go back and edit this post about ASDs. I was under the impression when first writing this that what I wrote was correct – it was my understanding at the time. Life has been full and I have been unable to get to this! Thank you for bringing it once again to my attention. While this website and work is interesting and I’m sure is very helpful to many, I want to point out some things that are incorrect. It is important that people are not mislead about autism so we can support those who have it effectively. First off, the statement “ASDs is a group of complex developmental disorders, including ADD, ADHD, schizophrenia, autism, depression and dyslexia” is incorrect. You have a number of different diagnosis listed here. “ASD’s” do not include those other diagnosis. I recommend consulting the DSM-V for accurate information on diagnosis mentioned. ASD”s are complex. THere is currently no known cause and it is likely a combination of factors. There is no quick and easy “cure” for autism such as adjusting one’s diet. Most of the research today cites many evidence based interventions that assist in the treatment. While many of the interventions stated here in this website may be helpful and healthy practices, they will not cure autism instantly. I think it is important to not mislead people in how they understand this complex disorder and it’s treatment. What I write here is all based on the most current research about autism. Thanks so much for sharing our post! Great website here! These waffles/pancakes leave your belly comfortably full. Not a drop of pain. I jazz mine up with carrot butter, as suggested, + saute lots of onion with parsley, summer squash and whatever fresh vegetables I have on hand. A big squirt of healthy oil tops it off. It’s so nice feeling comfortable AND full. I am sorry that you are having trouble purchasing these products. I have had others order recently with no problem and tried it now myself and all went through just fine. Can you tell me where you are trying to ship to and what exactly you are having trouble with? We’ll figure this out! Trying to place an order for veg. starterculture and eco-bloom Want to make some cultured vegs and can’t seem to order those products on your site. Please help. Works beautifully! Thank you so much, Tomas, for your spectacular work. No more staying up all night keeping temps stable with heating pads and coolers. Thank you immensely for your reply. I have a question about colon cleansing. I am wondering if you did enemas on your son to help him heal or did you just rely on the diet to cleanse his colon? I am doing colonics now for myself and I am feeling so much better, the difference is huge. I am thinking if I should do it for my son, too. And also, do you know what should be the ratio of good yeast to bad yeast in our gut? Thank you so much! I am so glad to have found your website. P.S. As an expert, do you think it is absolutely necessary to do GAPS intro diet to heal the digestive track and eliminate food sensitivities or can it be done with stage 1 BED? What is that on the crackers in your photo? An herb butter? It sure looks tasty. Very helpful. You even answered my question regarding timing of use within the B.E.D. Thank you! Your son may be craving fats while taking Young Green Coconut Kefir because his body is shedding toxins and repairing tissue, which is made up of cells. Healthy fats feed every cell in our body, so we need plenty of fats! Especially when a lot of old tissue is being replaced with new tissue as happens on a healing diet such as Happy Bellies Diet. I am a big fan of healthy fats and the role that they play to heal a damaged digestive tract. It is proven that natural unadulterated animal fats, dairy fats, egg yolks, fresh fish and other natural sources of fat are essential to health. Natural fats help to restore a strong immune system. The brain is made mostly of fat and needs fats to function well! Animal fat contain the amino acid, glutamine, which is primary source of fuel for every single one of our cells! That said, if the gut lining is permeable and irritated eating meat stock or soups instead of bone broth or the actual fat on the meat, may be easier on a healing digestive system – especially when digestive enzymes are low. Meat stocks differ from bone broth as they are carefully strained of cooked saturated fat. This is done cooking some meat on a bone with water for a short period of time and placing it in the refrigerator where the fat will harden and rise to the top to be skimmed off. Your son may be healing fast as children usually do and be ready for cooked saturated fats and bone broths. My children would choose roasted marrow any day over most other foods! I do not hold back as they are receptive and salivate for good fats. I eat them too and my cholesterol levels have been better than ever the past 3 years in eating the way I do. Coconut oil, egg yolks, raw cultured butter, bone marrow, bone stocks and meat stews, liver, etc. are all wonderful forms of fat. I also now use the fat that rises to top of my meat stock or bone broth and use it to cook the rest of our food with. As for your question about parasites..Our doctor diagnosed my oldest with parasites (intestinal) as he was itching like mad down there and had a lot of irritation in the area. I had the Comprehensive Digestive Stool Analysis test redone (http://www.gdx.net/product/10140). Systemic Candida is usually diagnosed by appearance and symptoms and lab tests are performed if infection does not clear with treatment. There is no real accurate medical test for systemic candida, as once the organism has left the intestinal tract and entered the blood stream it is difficult to trace. One of the best ways to determine if a systemic yeast problem is present is by observing your symptoms. If you are uncertain whether you may have a systemic yeast problem, a great first step is to take Donna Gates’ Candida Evaluation Test(found in The Body Ecology Diet book). This test can also be accessed online at http://bodyecology.com/quiz.php. It says that it took you two years to clear yeast out of your system. What tests did you use to find it out? thank you very much for such a thorough reply. Do you mind me asking why you are concentrating on healthy fats to heal your son’s sensitivities? My son craves fats when he drinks a lot of YCK and I would like to know the connection between them. I have read somewhere that high fat diet can also feed candida. Did you find it true in your experience? Also, how did you find out that your oldest had parasites? I am wondering the same thing with my oldest, as well. Watch out for Bragg’s Ginger & Sesame Salad Dressing. Their Liquid Aminos are the 3rd ingredient listed. Too bad because this is a great tasting dressing. Thank you for this! I found an almost empty bottle of the liquid aminos in my cupboard. It’s now in recycling. Will share your blog with the owners of my store. Both of my kids have been enjoying B.E.D. now for over 3 years. They love all the foods, including the sea veggies. Mind you I was fully macrobiotic before finding BED so they were already used to eating foods other kids may be less familiar with. Children’s bodies heal so much faster as they have so much more life energy than the average adult! My oldest nearly died from leaky gut and undiagnosed food sensitivities when he was 2 years old. He is now 10 years old and can eat ANYTHING. Though he does not and makes very good choices! My youngest still eats only what he is served. Both of my boys showed a lot of improvement in their health within 2 months of starting the body ecology diet. Many of those health issues have not returned. My youngest is still quite sensitive in some areas and we focus in on him with more fermented cod liver oil and good fats and egg yolks and organ meats, etc. He loves bone marrow and hiziki sea veggie with gusto!! Neither of my kids have been “diagnosed” with yeast overgrowth. Yet, because I had been diagnosed with systemic Candida when they were young and the fact that it is the mom who passes her gut flora on to the kids I very much felt that yeast overgrowth played a key role in both their issues. I had taken IV antibiotics during the birth of my youngest and his health suffered quite some with breath holding spells, mini seizures, thrush, cradle cap and diarrhea/bloating/gas as a toddler. My oldest had chronic parasites, bowel issues and lots of food sensitivities throughout life. Neither have these issues anymore, though my youngest still has a spell of diarrhea on the odd day, mostly due to poor food combining at school (fruit with grain). I did have a consultation with Donna Gates when I was first diagnosed with Candida and she said to work on my own health first before attempting kids. I am so glad she said this. As I would have been overwhelmed to deal with so much at the time of learning all there was to learn! I am not sure if quinoa would work as well in nori as millet does as it is a bit more mushy and. Perhaps try cooking your quinoa with a bit of amaranth or teff and use a bit less water than usual and that may work. My youngest who is 5 years old has never had a drop of sugar in his life or gluten. He has been eating the Body Ecology way for about 3 years now and his health has improved in many ways. You mention wanting more recipes for kids…have you checked out BEDROK (body ecology diet recovery for kids)?? Here is link to them http://www.bedrokcommunity.org/. They have lots of recipes there and ideas as well as an active discussion board to ask away on your questions. You may want to check that out! You guys are so sweet! Yes, a cookbook for kids (Happy Bellies for Kids!!) is in the works as are many other projects at the moment 🙂 My son and I love to cook together and now that he is reading and writing can write his recipes down on his own. We will keep everyone in the loop!! Wow! Tara sounds like your doing a great job raising your son. He sounds smart, confident, thoughtful and even health conscious. Ben, I agree with Shirley. Would love to make your breakfast dishes or buy a B.E.D. inspired kids recipe book. Your a great example to kids and adults alike trying to live a healthier lifestyle. That is awesome! I agree with Shirley: could we see the flax pancakes recipe? Looks like a delicious breakfast. I typically recommend people start taking bone stocks and more saturated animal fat once they’ve made progress in balancing gut flora and are able to digest fats properly. Yet, meat stocks (which are milder than bone stock) can be used while healing gut dysbiosis, especially if one has a leaky gut (where the intestinal lining is permeable). Meat is highly recommended in the early stages of healing gut flora imbalances, yet this food can be tough to digest for those with dysbiosis. That said meat stocks can be made and carefully strained of the cooked saturated fat that rises to the top. Bone stock provides amazing properties and fuel for the intestinal cells, helping to close up gaps in a leaky gut. Glutamine, also found in bone broth, is important metabolic fuel for cells in the small intestine. All said bone stocks and animal fats are wonderful to move towards as soon as you are able. During stage 1 of healing gut flora imbalances you can experiment with small amounts of easier to digest fats such as cultured, raw butter; ghee; coconut oil; fermented cod liver oil; egg yolks; young green coconut “pudding”; goat/cow milk kefir (if tolerated); wild salmon; sardines; olive oil; olives; avocado; X-Factor Butter Oil (Green Pasture); and other healthy fats such as soaked nuts and seeds. Lamb makes a nice meat stock that is gentle, soothing and full of healthy fats and using lamb stew meat can usually be tolerated by those healing the gut in the initial stages. Oh, please, Ben. Would you write up your recipes? I’d LOVE to make your breakfast! I think I can figure out how to do everything except the flax seed pancakes. Would you write up that one? Tara, thank you for your tips. It is funny that you put green smoothie in quotations. I have been making this kind of smoothie, as well, but I add avocado to it which makes it super creamy. Is this ok? Vita-mix is one of my kitchen “babies”, I love it. I eat flax dill crackers with coconut oil or guacamole, I cant tolerate dairy yet. Hopefully, one day I will be able to add raw cultured butter and ghee. I love the idea of cooked egg yolks wrapped in nori. Can I replace millet with quinoa? Millet is one of my food sensitivities. I have over 30 foods that I am sensitive to. How about your kids? Do they eat the same breakfast as you or do you serve them something different? I would love to get more ideas about kid-friendly BED breakfast. If you can find raw, dried and shredded coconut then you can just add some coconut kefir to that with some water and let it sit in a warm spot for a few hours. Then drain and rinse and you can either use it as it is OR dehydrate it again. If this process is too lengthy than just hold off on using dried coconut until the gut flora is balanced and you can handle this sweet food again. thanks for the recipe. I am confused about rendered fat benefits to heal the gut. Donna says that cooked saturated fats may feed pathogenic flora in an unhealthy digestive system, thats why I have been tossing the fat lately. What is your thought on this? Personally, I love dishes made with animal fats because I grew up eating meals made with them. Thank you for your reply. I did soak and dehydrate organic sesame seeds. I use them to make myself coco oil sesame seed candy that I like to have with my herbal tea. I grew up drinking tea throughout the day with sth sweet aside and I cant kick that habit no matter what I do. So I end up making candy sweetened with stevia and enjoying my afternoon detox tea or red raspberry calcium tea with it in the evening. I have a question about dried coconut. How do you culture it? I make coconut milk out of coconut flakes and culture it with YCK. But I never tried culturing the flakes on their own. What do you usually serve for breakfast? I feel like I have other meals down except breakfast as long as 80/20 goes. My son and I have many food allergies and sensitivities due to our leaky gut and candida overgrowth. I have been doing BED with him and for me for a while now and I have seen improvement in him and a bit in me. I slipped a few times, but kept strict with him. Did you cure your son’s food sensitivities just doing the BED or did you have to use supplements, as well? How long did it take you and your son to overcome yeast overgrowth? How diligent did you have to be with your diet to achieve the results you wanted? I am sorry for asking so many questions, but I really want to heal my gut and my baby’s gut, too. I am still learning and implementing BED principles even though I have been at it for a year. I do follow 80/20 with just about all my meals. I like to serve these waffles with Creamy Carrot Butter (http://www.happybellies.net/basic-recipes/creamy-carrot-butter/) and arame seaweed sauteed with onion. My boys especially love 1 or 2 raw egg yolks in a nest of the Creamy Carrot Butter while it is still hot so the egg yolk cooks a bit on the very bottom. We always have a small serving of steamed kale or other leafy green too. We sprinkle the whole thing with hemp seeds or soaked sunflower/pumpkin seeds and we all feel very satisfied!! Do you follow 80/20 with breakfast, as well? Or do you just serve waffles on their own for breakfast? P.S. I tried this recipe, they are yummy. I buy my raw almonds from a raw food supplier here in Vermont. You can also buy them online. Otherwise most “raw” almonds found in the bulk section in health food stores have been flash pasteurized and are no longer considered a live food. They will not sprout properly in this state. Sesame seeds and tahini are not on Stage 1 of The Body Ecology Diet as they go rancid easily, especially in tahini form. Whole sesame seeds are also more susceptible to contamination by the mold aspergillus. If you are going to eat sesame seeds than it is best to soak them for 12 hours in warm water and a warm spot or until slightly sprouted. This way they can be made easier to digest and more nourishing for those with gut sensitivities. May all bellies be happy!! Where do you get your raw almonds? Also, I am sensitive to all BED seeds and almonds, too, except chia seeds and flax. How bad is it to use sesame seeds and/or tahini once or twice a week while healing the gut? Would love recipes other than the way Thomas eats it. These Stage 1 & 2 lists are extremely helpful. I keep a copy of each in my B.E.D. binder and a copy in the car for trips to the grocery store. Thank you for making these up and for sharing them with us. So much good information from you, Tara, and you too, Mari. I never knew the bit about the body’s reaction to travel. Will have to pay more attention to the body over mind. What is your source for the baked blue corn chips? I haven’t been able to find any in my store that don’t have canola or another of the “forbidden” oils. And (1) deli meats are really okay? (2) why not eat the egg whites? Thank you for leading the way, both of you. Thank you! You can replace coconut oil with high-quality ghee or palm fruit oil if you tolerate it. Are you following the Body Ecology Diet? If you test for Candida, the Comprehensive Digestive Stool Analysis with Parasitology test is highly recommended. I know many Naturopathic doctors carry this test and I believe you can also self-order it, but not entirely sure. So excited to see an approach to preventing GBS as well as options for healing. Thank you, Tara! Thanks so much, Tara, for sharing your story and reaching out to others. I feel pretty certain that I have an overgrowth of candida. I’ve had digestive issues for as long as I can remember. Probably my most annoying symptom is Athlete’s Foot, which I’ve had for more than 4 years now. I’m having a very difficult time getting rid of it, and I now have a couple of toenails that are infected. I have been using the Body Ecology cultures to make fermented food dishes for a couple of months now. I started to see a little improvement, but with the Christmas holidays, I gave in to temptation and had a little bit of chocolate and some fruit, and I can tell that it has affected me in a negative way. I am getting back on track now and guess this is going to take a while to overcome and will mean permanent lifestyle changes to keep under control. I know I have a problem with candida, but I may want to be tested for official confirmation. Thanks again for sharing your story! I was tested using the Comprehensive Stool Test Analysis and Quests Diagnostics Blood Test. The stool test consisted of 5 tubes that held 5 days worth of samples of my bowels. This test was mailed by my Naturopathic doctor to a special laboratory. At the time I had all the symptoms of compromised digestion (bloating, heartburn, constant pain in my stomach/intestines, constipation, diarrhea, etc). Both tests showed high levels of Candida in the bowel and blood. Unlike a localized yeast infection (i.e. vaginal or colon yeast infection) I had an internal overgrowth of this yeast. My issue most likely began when I was a young child due to a leaky gut that allowed Candida organisms to pass through the intestinal lining into the bloodstream (along with undigested food molecules) and move deep into the softer tissues of my body, especially my brain (I was diagnosed with ADD at the age of 15). You can read more about my own personal experience with Candida on my website at http://www.happybellies.net/. How were you diagnosed with systemic candid? I asked my medical doctor about testing me for candida, but he wasn’t interested in checking me. Actually, I’m not sure he really knew how to test me. Anyway Thanks! I’m enjoying your website!!! I am glad to hear of your excitement about making cultured veggies! They have truly become a mainstay in my own families diet and we rarely go a day without them 🙂 It sounds like you have found a perfect environment to “incubate” them in and that is such a relief. Just make sure temp. does not go below 70 and is consistently not more than about 72 degrees and you are good to go. I check on mine daily while they are culturing as they do become like babies once ou invest in making them!! If you find that you would like to try the starter let me know as doing so ensures you a very potent finished product. Also, if you have any digestive issues whatsoever the extra counts of good flora in the cultured starter can give you the therapeutic levels needed to replenish and maintain good probiotic levels in the digestive tract, especially the colon. Do keep in touch about your success or questions! Hi, Tara. I am looking forward to trying to make some cultured vegetables. I was very glad I went to your workshop at the co-op. I was giving up my knitting group, and I am glad I did! I am going to try to make some without the packaged culture. With your generous gift, I am noticing a difference in my “morning constitution.” I knew I needed some help in the digestive area of my life, and I am fortunate that I saw the workshop and attended. I will keep in touch to let you know how it’s going. I am investigating spots in my basement because I have a pellet stove down there that will keep the atmosphere warmer than on the main floor. So far, it has hovered around 69 – 72 degrees. I am also thinking about just keeping it in a cooler in my kitchen and checking on it frequently (I will put a slightly microwaved item in there to keeping the temperature up). Anyway, it’s all very impressive and I am a believer that food can be medicine. Mine were slightly sour but delicious. Did you use a mandolin? This is an essential tool and your product will come out quite different without one as it is hard to get a thin crunchy (non-soggy) chip otherwise. I am not a big tool kind-of-cook but a mandolin is very handy to have around for such a recipe! Our camping trip was a success albeit the mosquitoes and horse flies! I will be posting soon on our adventure…now about your own long car-trip this summer and desire for animal protein along the way. *Ghee is a good fat to have on hand. *I would suggest dehydrating (do you have a dehydrator?) some meat jerky. *Raw egg yolks are wonderful. I have 2-3 a day mixed with coconut spoon meat but you could mix it with cow kefir/yogurt if your body tolerates dairy. Otherwise they can be mixed with a variety of foods (dropped into hot soup or atop a bed of steaming hot vegetables). *Will you be bringing a portable stove? If so, you can find fresh fish and meats along the way and cook them up this way. I can recommend a couple different single burner gas stoves if you would like. *You could also make raw butter beforehand and add in a substantial amount of sea salt to preserve it. *It is not usually tough these days to find deli turkey, or other hormone-free meats, in grocery stores. They are great as sandwich roll-ups. How does all that sound?? Good luck and keep us posted on your own success! They fermented for two days, temperaure was between 20 and 24 degrees Celsius. I rinsed and peeled them, and cut them into thin slices. Are they not supposed to taste sour at all? Once again, thank you for your fabulous blog and for your engagement. Did you go on your camping trip yet? Can’t wait to hear about what you brought and what you experienced. I myself am preparing a long on-the-road tour with my band, and I am packing cultured veggies into jars, excited for how they will react to long days in a hot tour bus with only a portable cooler to keep them fresh. Any ideas on how to get animal fat and protein without a fridge (I am counting on occasional access to kitchens on the way)? Love and peace be with you, Tara! I am really enjoying your questions as they have me thinking and wondering more myself! 1) Black currant juice is mentioned by Donna as fine in Stage 1 and is great for the adrenals. Just eat them fresh/juiced rather than dried. 2) Donna also wrote a recent newsletter on watermelon slush in the summer as being very good for you at this particular time of year and is fine for stage one as is one made with kiwis. How long did you ferment them for? Did you rinse them first? I see that I did not mention to take that step but it is an important one, especially for minimizing sour-flavor. Sometimes if the equipment used was not fully clean then more bacteria than is helpful can be introduced during the fermentation process leading to the product becoming overly sour. I will revise my writing to make note of both of these things. Let me know how your next batch comes out. I tried fermenting the sweet potatoes at home and they just turned out incredibly sour. It didn’t taste so well cooked so now I just eat them raw instead. Did you ever experience this? Did I ferment them too long? Summertime = lovely, tempting fruits and berries wherever I go. Since I’m recovering from Candida and keeping to Stage 1 of the BED, I’m avoiding all other fruits than cranberies, currants, limes and lemons. However, there are many berries here in Scandinavia (red currant, green currant) that aren’t mentioned in The Body Ecology Diet book. As long as they are sour, it should be fine to eat them, right? Also, I’ve tried to ferment watermelon slush (m-m-m!) and kiwis (even better!) which takes the sugar out of them and make them nice and sour. Then I add Stevia to make them sweet again, and this works great. I haven’t found any info on fermented fruits anywhere on the web or in the BED book though, and I’m unsure if these foods are allowed once the sugar has been fermented away. Do you know anything about it? Since fruits are best eaten alone, I have the fermented fruits on an empty stomach, first thing in the morning, either as a drink or in a smoothie wih herbs and some greens, and wait an hour before eating proteins/ grains etc. I’m also wondering if you think it is possible to combine them with other things when they’re fermented? Wow! I’d LOVE for you to be my personal food organizer on my long distance travels! So much thought and such beautiful meals in a limited amount of space. I’d like to hear the sequel of how everything went. Thomas has given me a whole new perspective on fish heads! Thank you for your excitement. I am glad you found your way to my site! I truly love sharing all I am learning and have learned. I think it is so valuable for us all to do so. 2) Freezing coconut water. Hmmm. I have heard different thoughts on this, many say that though it changes the molecular structure of the water it still works. I think nowadays you can most easily find a health food store that carries the canned coconut water. Though I do not recommend it, it comes in real handy when you are in a pinch as well as it cuts down on your worry. You are better off using the coconut water fresh on your days home and then freezing the spoon meat itself for travelling. The meat can stand up better to the freezer due to its solidity and retains water differently than does the liquid coconut water. Don’t you think? I do this quite often myself. I will freeze 1/2 a case of the spoon meat itself after it has been blended but not fermented. I then thaw it accordingly and culture as usual. A frozen bag of coconut meat puree will be fine on an airplane and will help keep your other foods nice and cold!! I always take a bag or 2 when I travel and then some of the kefir to culture it. Even if you are only taking carry-on luggage, you are allowed to bring up to 4 oz. of liquid. The perfect amount of coco. kefir to culture 4-5 coconuts worth of spoon meat!! BTW, I also bring along a quart-size mason jars to ferment it in. Please keep in touch as to how it all works for you as I am interested, as I am sure others are too. Thank you for your support and I a glad you are enjoying what you are seeing thus far!! When such a rash is found on the face, there stands a good chance that it is related to the food that he is consuming (or you if giving him your breast milk). Of course one must also rule out the fabric of clothing that his face and head are rubbing up against during the day/night. There are times when certain fabrics (clothing/sheets) /detergents /lotions /soap can trigger a rash, especially if you are nursing. I, myself, tend to look a bit deeper at what is off balance internally for the body to react so wildly to something outside of itself. It is my opinion that most rashes are triggered from the types of food being placed into our bodies. Also, if he was only 2 months old when the rash began it makes good sense to look first and foremost at his diet, along with yours if you are nursing. The skin is one of the main organs of elimination and one can see quite quickly (in most cases) what foods are affecting the person. The skin is a valuable tool to be able to observe. As you begin to make changes in you and/or your child’s diet you can feel comforted to know that you can use this very visible part of his body to gauge how he is doing overall. His bowel movements are also good to observe and can tell you a lot about his inner state. The face is a very tender place with skin that is much more soft in places than other parts of the body so when we are affected by an irritant the face tends to be one of the first places the rash will present itself, along with the back of the knees, the elbow, the inner part of the thigh…especially in babies and so on. Not knowing the types of foods being used in your diet, it is hard for me to know what foods may be affecting him. Desiree, an elimination diet may be very helpful to you to narrow down things. Hope my words have helped some…you are doing great. Sometimes, we must only bring our full attention to something for it to change. I found your blog a couple of days ago and I am amazed and thrilled to read and learn from your experience. As a Body Ecology newbie this is most valuable! Thank you for taking the time to share your exciting discoveries. I read this post with particular interest as I am a musician and travel a lot. I have taken a couple of short trips lately (max. 5 days) and brought loads of cultured veggies in glass jars, stored in a travel sized cooler and borrowing the fridge at my destination. I don’t have a car and travel by bus and train, so it has to be easy to carry all this stuff around. I am currently trying to find an answer to how I’m going to do this traveling by plane. You say that “Travelling by plane with cultured vegetables is somewhat do-able”. How would you pack it? “Anyhow what I love the most about cultured vegetables is the juice emitted from them, so fizzy and alive, and definitely not able to travel by plane without major explosions! !” How does this work? I’m wondering if a packed glass of veggies + juice would explode? Aren’t the temperatures in the luggage cabin very low? And for the coconut kefir – how do you think it would work if you froze the fresh, un-fermented coconut milk and fermented them at your destination? Or does freezing it alter its structure and damage the fermenting process? but not coconut kefir unless it is frozen, by which some of its potency will be lost. Anyhow what I love the most about cultured vegetables is the juice emitted from them, so fizzy and alive, and definitely not able to travel by plane without major explosions!! Tara, I just found your website. I’m also in Central Vermont and am 5 months into integrating macrobiotics into my life. I’ve connected with the folks who own Rhapsody in Montpelier but am looking for more people who follow a macrobiotic lifestyle. Any ideas or leads? I look forward to reading your blog! Looks great! Emily (Barre, VT). My son is # months old and since he was 2 months,he has had red scaly rough patches on is scalp,cheeks and forehead cou;d it be Eczema? Thank you for your post…I am sorry to not have responded sooner but I am just now learning my way around the site. Todd has been helping me quite a bit to get started and I sit with a web designer/programmer this month to get things really flowing and more professional. At that point I will go public with the site. Yes, I hear from so many, especially parents of young children, who have eczema. I will soon be posting about the difference between eczema and psoriasis for I have been asked many times about these 2 different, yet strikingly similar, conditions. Dietary changes and home remedies that help one will often help the other. For now, I get the basic structure of my site figured out before I can attend to the joys of “blogging”. My sister suggested this blog and its excellent. keep up the good work! These look soooo yummy!! Can’t wait for you to publish recipes. Tara, it is fun to see your fantastic childhood imagination evolve into the world of being equally creative in the world of food allergies. I am so proud of you growing so beautifully in this area. You are helping others learn skills and build confidence as they chew away (ha!) at their own food issues.